Takes you to Kilimanjaro's true summit, Uhuru Peak and you can start your trek any day of the year! This Umbwe is a steep, spectacular, and direct route to reach Uhuru Peak. You can add an extra day to your itinerary to explore or relax along the route. 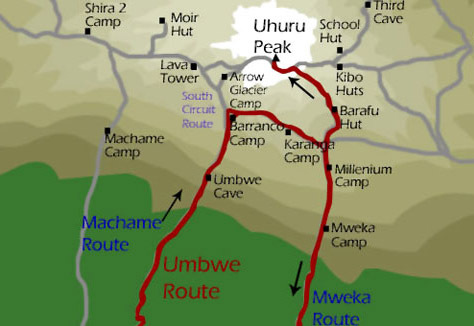 This Umbwe is the most spectacular and direct way to reach Uhuru Peak. This route became famous when it was featured in the dramatic IMAX film Kilimanjaro - To the Roof of Africa. On the Umbwe, you pass through strange landscapes as you climb through five climate zones ranging from rainforest to the summit’s glaciers. The route follows a forested ridge to the moorlands, then traverses below the southern icefields to reach the Machame Route, which you follow to the summit. This steep, tough, and in places slightly exposed trek is suitable for a fit individual used to walking in mountain areas. Because of the route’s steepness, it is seldom used, and trekking poles are useful on the steep, slippery slopes in the rainforest. All your equipment and supplies are carried by porters and a cook prepares all your meals. Unlike the Marangu Route where you sleep in huts, on the Umbwe you sleep in tents (tents are included), and the porters will pitch your tent for you. Meals are served in a dinner tent or on a blanket outside. You can add an extra day to your itinerary to explore or relax along the route (best taken at the Barranco Camp). If you arrive at the Kilimanjaro Airport, you will be met at the airport and transferred to your hotel in Moshi or Arusha (airport transfer is not inclueded in the tour fare, $20/person/way from JRO, $50/person/way from DAR). We recommend at least one rest day before starting your trek. If you are transferring from Nairobi, this can act as your rest day. The average hiking day begins between 8-9am and is about 5 to 6 hours, walking very, very slowly. The distances you will hike each day are very moderate so as to acclimate a little at a time. Your guides will repeat over and over, "pole pole" (po-ly, po-ly), which means "go slowly" in Swahili. Today guests will arrive, be met at the airport, and transferred to their hotel in Moshi for an overnight stay. Today guests will begin their day early with a briefing, followed by breakfast and an hour drive from Moshi to Umbwe Village, where the guides and porters will pack our equipment and supplies, and provide us with a lunch pack. We will start their ascent at the small Umbwe Gate just above the village and follow a gentle winding vehicle track for an hour to a signboard that announces the small steep Umbwe trail. Next, guests will climb up for several hours through a dense forest of rubber trees and giant fig trees. We will overnight at the Umbwe Camp and enjoy a hot meal in the evening. Moshi, TANZANIA Moshi, in the very northeast of Tanzania, sits on the slopes of Mount Kilimanjaro, the highest point in Africa and a dormant volcano. Many hikers and climbers stay in Moshi before exploring the famous mountain on which is resides. We will begin our day with breakfast and then begin a steep climb through thinning forest glades. As we climb further up the ridge, we will be able to catch a view of the Uhuru Peak looming overhead. After lunch, we will hike into a zone of giant groundsels (also known as Senecio Kilimanjaro): one of Kilimanjaro's most unique garden treasures. We will arrive and overnight at Barranco Camp. After breakfast, we will continue up a steep ridge to the great Barranco Wall and arrive just below the Heim Glacier. From here we can truly appreciate Kilimanjaro's natural beauty. With Kibo's Glaciers soaring overhead, we will descend into the lush Karanga Valley Campsite. From the camp, we can look east and see the jagged peaks of Mawenzi jutting into the African sky. After a hot lunch at camp, we will have free-time to rest or explore the surrounding area. After two long days hiking, this short day is very important for acclimatization, since we will embark on summit push the following day. Guests can add an extra day to their trek by staying at Barranco Camp for two nights. Guests will hike to the Karanga Valley Camp on Day 5, the Barafu Camp on Day 6, the summit on Day 7, and finish the descent on Day 8. Adding this day will ease effort, and amplify your acclimatization. In the morning, we will hike east over intervening ridges and valleys to join the Mweka Route, which will be the descent route. After hiking up the ridge through a sparse landscape for another hour, we will receive a hot lunch at the Barafu Hut. The last water on the route is in the Karanga Valley; there is no water at Barafu Camp, even though Barafu is the Swahili word for "ice." The famous snows of Kilimanjaro are far above Barafu Camp near the summit of the mountain. We will pitch a tent on a narrow, stony, wind-swept ridge. **It is essential that guests familiarize themselves with the terrain before dark to avoid accidents. Additionally, guests should prepare equipment and wear warm clothing for the summit climb, and drink plenty of fluids. After an early dinner, we will have the chance to relax and enjoy a few hours of precious sleep. After a breakfast of tea and biscuits, we will begin the 6-hour climb to the summit at approximately 11:30 p.m. Heading northwest, through heavy scree between the Rebmann and Ratzel Glaciers, we will arrive at the most challenging portion of the route at Stella Point. Here, we will stop for a short rest and a chance to see a breathtaking sunrise. From Stella Point, we journey to the top of Marangu Route to Uhuru Peak. At the top of the summit, we can take in the surrounding scenery, and enjoy a deep sense of satisfaction and personal accomplishing from the mountain tops. After the 3-hour descent from the summit back to Barafu Camp, we will take a short rest and collect our gear before hiking into the forest to Mweka Camp. Located in the upper forest, we can expect mist or rainfall in the late afternoon. Dinner and washing water will be prepared and we can purchase drinking water, soft drinks, chocolate and beer at the camp office. We will spend the night at Mweka Camp. After a well-deserved breakfast, we will take a 3-hour hike back to the Mweka Gate. Here we will have an opportunity to sign their name and add details to the park register, and successful climbers will receive summit certificates. Climbers who reached Stella Point will be issued green certificates and those who reached Uhuru Peak will receive gold certificates. From the Mweka Gate, we will continue down to the Mweka Village (if the road is deemed too muddy for vehicles, we will be required to hike 1-hour to Mweka Village). Here, we can enjoy a hot lunch. Finally, we will be driven back to their hotel in Moshi where we can enjoy an overdue hot shower and comfortable accommodations for the evening. Note: Guests are encouraged to wait until all of their gear has arrived at the Mweka Gate before tipping park staff. Today guests will depart from Moshi. Please see "Departure and Return" for more detailed information regarding pickup and drop-off times and locations. Arrival: Guests can choose to arrive at any time they want, transfers are available 24 hours. Return: Guests can choose to fly out anytime they would want if there is no activity on the last day. Air travel, country entry or departure fees, airport porter fees, visas, phones, valet, all items of a personal nature and beverages and food unless otherwise stated. Airport Transfer: Airport transfers available at an extra cost. From JRO to Springlands hotel we charge US $25 per person per one way. Food: The staple foods in Tanzania are meats, starches, and fruits. Some western foods are difficult to find locally (herbal tea, soy products, specialty items). You may want to bring some of the items with you as well as comfort foods (like chocolate), and high-energy foods (Power bars, Gatorade, etc.). Breakfast, lunch, dinner, and afternoon tea are provided on the trek. All meals will have some sort of fruit like bananas, oranges, papayas, and watermelon. Most meals will also have a selection of hot drinks like instant coffee, tea, and hot chocolate. Because of the exercise and high altitude, you is recommended that you drink at least 3 liters of water a day. The porters will purify water for you at each camp. Altitude may diminish your appetite, but it is very important to keep eating. Money: The local currency is Tanzanian shillings. U.S. dollars, Euros, and credit cards may be accepted by larger stores and hotels, but the exchange rate is better with shillings. ATM's are only available in larger towns like Moshi and Arusha. Most people bring the bulk of their money in travelers cheques, but will also bring some cash including smaller bills. For travelers cheques, there is often a $1/cheque fee, and the exchange rate is better for $100 cheques. When you exchange money, be sure to get some smaller bills as change is not always available. Budget $250-350 per hiker for tips for the entire climb. Gifts: Guides and porters also appreciate your warm clothing, shoes, and packs. You may want to bring some older clothing items just for this purpose. Expectations Tips should not be dependent on whether you summit or not, but rather whether they were professional and had your best interests in mind. In the day pack, take along water, sunglasses, camera, binoculars, rain pants, and jacket at a minimum. Add any other items you might need during the day, since you may not see your porters until the end of the day. Clothing You want your inner layer to be wicking - no cotton. Your next layer should be insulating and warm, and your top layer should be water proof but breathable. You will need clothes for hiking during the day, lounging in the evening, and for sleeping. Layers are important as temperatures vary greatly. Kilimanjaro may be near the equator, but it gets cold up there! Water bottles and Camelback (2-3). Get 3 liters of bottled water before the trip (available at the Springlands Hotel). Your guides will boil water for you along the route, or use steripens for water sanitation. Make copies of passport, TZ visa, airline tickets/schedule, and travellers cheques numbers. Leave a copy with someone at home and put a copy in a separate place in your luggage. 29-14 days prior to departure ? 50% of total purchase amount. Less than 14 days prior to departure - 100% of total purchase amount. Should the canceling party be able to find a replacement for themselves no less than 14 days prior to departure and the replacement completes this booking form individually, no cancellation fee. However, should no replacement be found by 14 days prior to departure, a 100% cancellation penalty will apply to the canceling party. Tour Cancellation: We reserves the right to cancel or re-schedule any tour departure in accordance with operating requirements or circumstances beyond its control. If cancellation is made any time prior to departure* of the tour, Gotobus' only liability will be to refund to the passenger the amount it has received for the tour booking. We will try to re-book the same or similar tour. Please note that we are not liable for any cancellation penalties incurred on any other travel arrangements including air tickets purchased separately from customers. We are not responsible for any other travel arrangements affected due to our cancellations.